Perhaps the most relevant and interesting forams for the reef aquarist are those which make use of endosymbiotic algae. In a manner that is essentially identical to that seen in zooxanthellate corals, the host foram provides their algal symbiont with nitrogen and a stable cytoplasmic environment in exchange for the excess carbohydrates produced during photosynthesis. This is clearly a prosperous lifestyle, as many of these species are able to attain a greater abundance and larger size than those lacking symbionts. 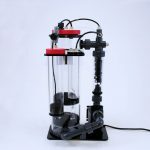 This great productivity also means that these photosynthetic forams contribute considerably to the calcium deposition of coral reef habitats, and, through the dissolution of their alkaline tests following death, they help to stabilize the pH of the stagnant lagoons which they frequently call home. Globally, some 5% of the total coral reef carbonate budget comes from forams, with roughly 80% of this coming from the larger, symbiotic species. 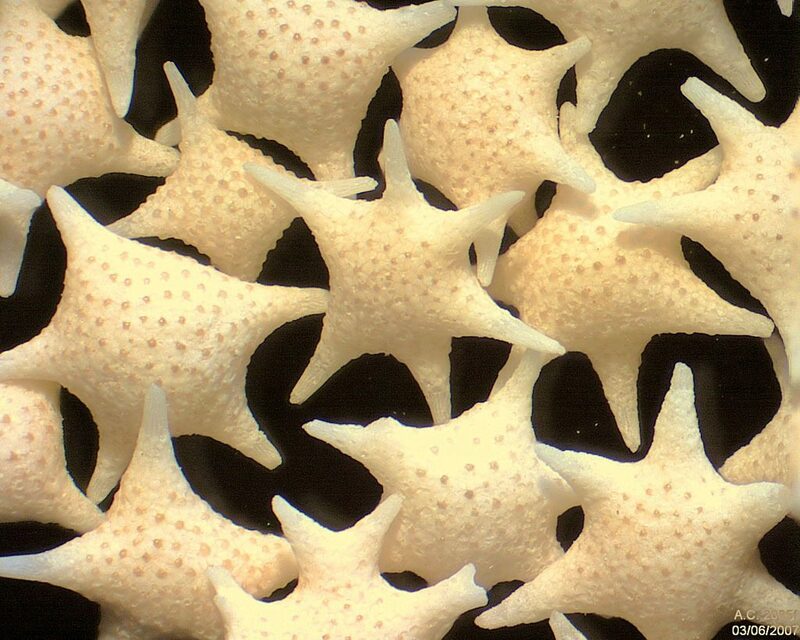 In a study conducted on the Great Barrier Reef, 30% of the total calcium carbonate produced was derived from forams. They’ve even been investigated as a possible canary in the coal mine when it comes to the looming threat of climate change—relative to the aragonitic skeletons of stony corals, shallow-water marine forams typically secrete a magnesium-rich, calcitic test which begins dissolving at a higher pH. Uploaded by Rishika Janaki on 2016-02-02. 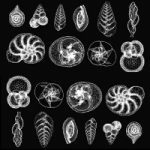 The discoid, multi-chambered Amphistegina is one of the more common forams from shallow tropical waters, and, in turn, it has been the recipient of extensive study regarding its physiological relationship with its symbiotic diatom. 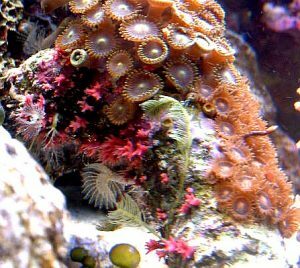 Just as in corals, Amphistegina can bleach from stress and become photoinhibited when receiving too much light, but, unlike in corals, Amphistegina is able to move itself into lower light levels to compensate. It’s also proven to be a good bioindicator for a coral reef’s health, as this foram becomes increasingly numerous in the type of pristine, nutrient-poor habitats that promote lush coral growth. 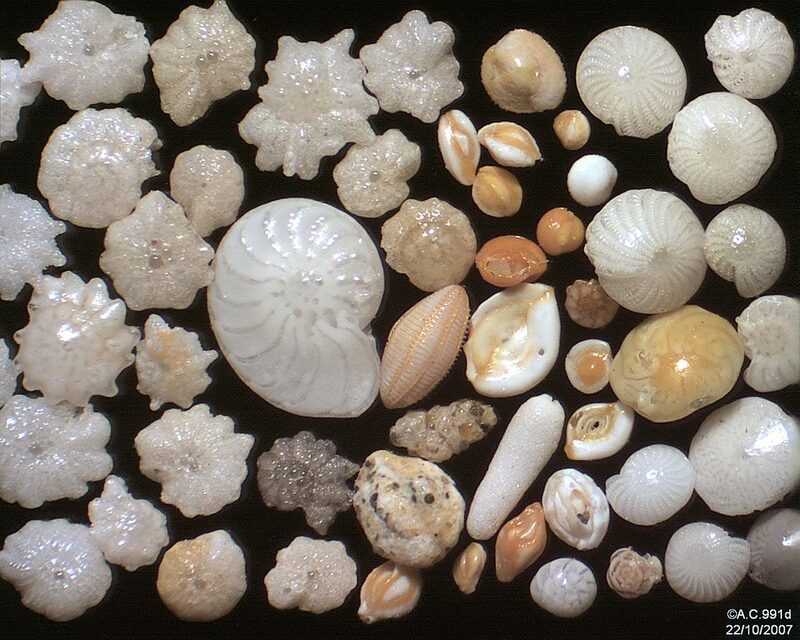 Given its abundance in shallow marine habitats, it also plays an important role in the formation of calcareous beach sands, with individual tests capable of remaining intact for 1,500 years. In Hawaii, beach sediments can be upwards of 25% Amphistegina tests, while the sands of Kapingamarangi are almost entirely (~90%) comprised of it. Spined hyaline taxa, such as Calcarina and Baculogypsina, are some of the most charismatic foraminiferans associated with reef habitats. They likewise form a common component of tropical beaches and, when particularly abundant, are referred to as “star sand”. 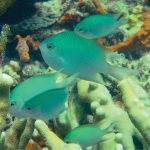 They are most prevalent in high-energy reef crests experiencing lush algal growth, which perhaps explains their unusual morphological adaptations and their apparent rarity in reef aquariums. Here is a time-lapse of a living soritid foram in a reef tank, ~100x real time. This is one of my favorite videos I’ve made so far because it captures the behavior of these creatures in a more natural environment. It was shot using a Nikon D80 and Micro-Nikkor 60mm lens through the glass of the tank. Where most forams are microscopic, seldom exceeding a millimeter or two in size, Marginopora is a true giant in the group, with a test capable of reaching nearly a centimeter in diameter. It belongs to a diverse family (Soritidae) of disc-shaped species that internally possess a long, spiraled tube divided into chambers. This group (which includes the similar Amphisoros and Sorites) are some of the most commonly noticed forams in the reef aquarium, resembling tiny, beige coins lying atop rock and sand. They also contain endosymbionts, but, in contrast to Amphistegina, this family makes use of the same dinoflagellate as in corals: Symbiodinium. Though, whereas a coral typically selects from a relatively narrow pool of Symbiodinium types, Marginopora has been documented to use upwards of two-dozen distinct varieties, which might suggest a greater tolerance for environmental stress than that seen in corals. Aside from these free-living species, a small number of taxa have specialized in an encrusting way of life. Easily the most familiar of these is a red branching foram common to any reasonably diverse reef tank: Homotrema rubra. It’s unusually vibrant color is said to come from an iron salt (though the purpose of this is seemingly unknown), and it differs ecologically from most forams in capturing its detritivorous diet directly from the water column. A second branching species common to reef tanks but white in coloration is thought to be a species of Miniacina, a genus differing in certain pedantic details of its internal configuration. 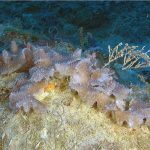 Another unusual aberration can be seen in Gypsina plana, a flat, encrusting reef species that can spread to many centimeters in diameter—a truly monstrous size for a single-celled organism—and might easily be confused for a white coralline alga.